As I noted in a previous post, despite the fact that globally 2016 was a horrible year, for me it was amazing. I reached levels of growth I never thought could be possible. And as I usually do, I’m reflecting on my Word of the Year (an exercise my good friend Mat Wilcox has been doing for decades). Last year’s Word of the Year was FOCUS. I promised myself that, no matter what, I wouldn’t succumb to the temptation of extending myself too thin. That I would focus on my own work and my own research and on one set of topics instead of wanting to Do All The Things and participate in All The Events. As anybody who knows of my polymath tendencies, I tend to be interested in a very broad range of things. This means that sometimes I extend myself too thin (there are only so many hours in the day). So, overcoming my own FOMO (Fear Of Missing Out) in 2016 was really, REALLY hard. So many things have (luckily) come to me really easily. I am a professor and hold a PhD, partly because I love learning, I love reading, and I love analyzing data, thinking about complex problems, explaining phenomena. But I am capable of reading this much and learning this much (and I recognize my privilege) because I am physically abled and I speed-read, I touch type in excess of 90 words per minute (often recording 100 words per minute), and I have a quasi-eidetic memory. Some of these things have come to me naturally (the good memory), but also through hard work (the typing speed and the speed-reading). But in no way, shape or form have I had to conquer myself to achieve these things. I love reading, I love typing and I love learning and absorbing information. So, yes, I have worked hard to do what I do, but I have not conquered my dislike of any of these, simply because I love them. I love doing a lot of things that many people find hard to do, boring or too challenging. 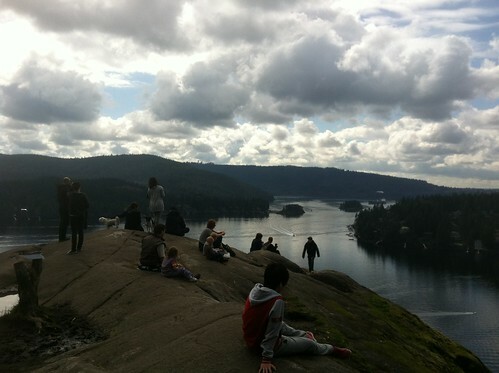 I have conquered relatively tough hikes, for example the one shown above in Indian Arm/Quarry Rock in North Vancouver (Deep Cove) because I LOVE hiking. I don’t conquer my fear of heights because I don’t have one. I don’t conquer a fear of crowds or public speaking because I don’t have one. Even the minor degree of claustrophobia that manifested itself last year is gone. But I know 2017 will bring me many challenges. I will need to conquer them all to succeed. I know there are many fights out there that I will have to conquer my own instinct to meddle in these and participate, and just stay on the sidelines. I know there are many topics that will appear appealing to me, and I will need to conquer my own drive to start a new research project. Photo credit: Lynn Alexander. Creative-commons-licensed, on Flickr. Perhaps the toughest challenge I will have to conquer is my combativeness. I tend to be belligerent (not unreasonable, I just simply like a good fight), and that’s part of my martial arts training, my competitive volleyball training and my upbringing. When I was a teen, I was bullied relentlessly. I learned martial arts to fight back. And the combativeness has never left me. I am the kind of academic who, when reading something or listening to someone say something wrong, I NEED to correct them. When I see something wrong, I need to fix it. I know, I’m horrible. And that’s what I need to conquer: the many challenges facing 2017. My own combativeness. My FOMO. The reality of a new global order where compliance with rules is diminished and institutions are eroded. There are so many things to overcome, challenges to be conquered, and I want to push myself every single day to conquer something. To be better than I was yesterday. 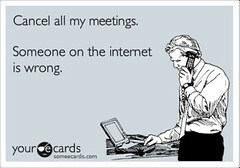 To stop myself when I want to engage in a futile fight (these are quite abundant on Twitter, let me tell you!). My word of 2017 is CONQUER because I think I am capable of overcoming the challenges that are coming up in 2017. I’ll work harder than I did in 2016, but with a smarter, more focused approach. Tagged with growth, personal life.